During World Animal Week 1st – 7th October 2018, the Irish Pet Advertising Advisory Group (IPAAG) is launching a campaign to raise awareness about the dangers of responding to online pet advertisements. Thousands of puppies, dogs and other animals are advertised on DoneDeal.ie and other online classified websites in Ireland every month, highlighting the sheer scale of the demand for people opting to purchase a pet online. Being able to sell puppies online makes it very easy for unscrupulous breeders to conceal the substandard and often dangerous conditions their puppies come from. Animal welfare organisations regularly hear from individuals and families who purchased a pet from an online advertisement only for it to fall sick or even die soon afterward. drip. But, sadly like many puppies who contract the virus, she didn’t survive. to be sold. When Gordon bought his puppy, the breeder gave him a vaccination card for her. Animal Cruelty Helpline by visiting https://www.ispca.ie/cruelty_complaint or calling 1890 515 515. Leading animal welfare organisations (ISPCA, Dogs Trust, IHWT, Donkey Sanctuary, Irish Blue Cross and MADRA) along with representatives from the veterinary profession and websites advertising pets for sale joined forces in 2015 to develop a set of minimum standards for websites to help protect the welfare of animals that are advertised online and ensure that any illegal activity is identified and investigated. * Have you considered adopting a pet from your local rescue centre first? * If you have decided to go online to source a pet, ensure the website has signed up to the IPAAG minimum advertising standards. Visit https://www.ipaag.ie for more information, tips and advice. * Different breeds have different requirements and temperaments. Research is important to ensure your new pet is suitable for your family and lifestyle. * If you have already completed your research, ask your vet to recommend a reputable breeder or contact the IKC (Irish Kennel Club) for advice if you are looking to get a pet. * Always ask to see mum and puppy interacting with each other and be concerned if you can’t. * Are the facilities clean and does the litter of puppies appear to be alert and healthy? You should be able to handle the puppies freely under supervision. * Ensure any new pet is old enough to leave its mother – puppies need to be at least 8 weeks old. * Ask the breeder if they are registered under the Dog Breeding Establishments Act 2010. If the answer is yes, ask to see the certificate issued by the Local Authority. * Microchipping is a legal requirement for all dogs and puppies once they are 12 weeks old. A puppy must be microchipped and the ownership transferred if applicable, even if this is before 12 weeks. It is very important that the change of ownership form is complete and the buyer must produce ID and proof of address to the seller. * Always ask for a copy of the veterinary records such as the vaccination certificate, microchipping details and treatment record for parasites. If you are unsure about it, speak to your local vet. * For pedigree puppies, check that the Irish Kennel Club registration papers and the parents’ hereditary disease screening certificates, where appropriate, are in order. * If you suspect a puppy has come from a commercial breeding establishment, please don’t take it out of pity. You may think you are saving a puppy but you will be fuelling the puppy farm trade demand. * Wild or exotic species have specific needs and are for specialists. Is it dangerous, wild, or even endangered? Check it will make a suitable pet. 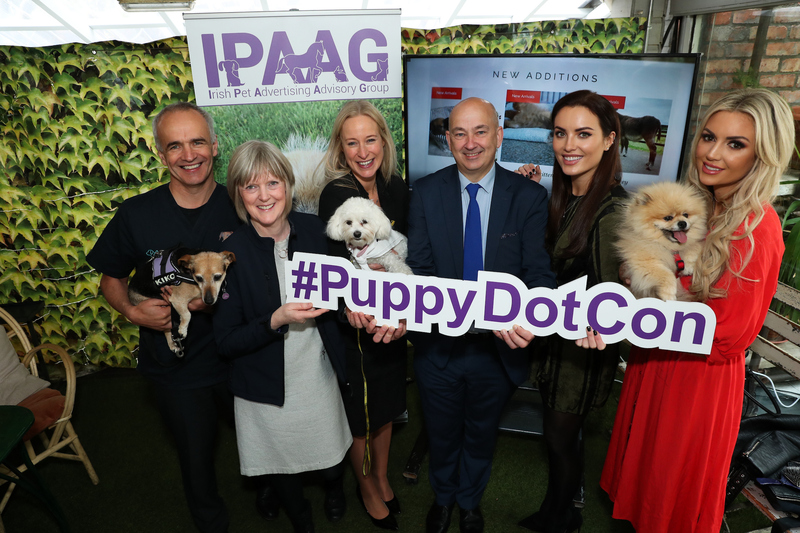 On 15th April 2015 leading Irish animal welfare organisations, representatives from the veterinary profession and websites advertising pets for sale launched the ground breaking and progressive IPAAG Minimum Standards at the Mansion House, Dublin. This major initiative will improve the welfare of the thousands of pets advertised online on a weekly basis. Minister Simon Coveney said: “I am delighted to endorse the IPAAG Minimum Standards for the online sale of animals. It is encouraging to see animal welfare groups working together with the veterinary profession to engage with online retailers to develop guidelines for the advertising of animals online that will ensure that the welfare of animals being sold is protected and that illegal activity is identified and acted on. I would strongly encourage websites that advertise animals for sale to comply with these minimum standards”. IPAAG introduced a set of minimum standards for websites to ensure that the welfare of animals sold online is protected and that any illegal activity is identified and investigated. In addition to providing standards for the online advertising of animals for sale, IPAAG will also provide an opportunity for the buyer to be educated on what criteria to use to identify a responsible breeder. Online websites that comply with the standards will provide links to www.ipaag.ie,which will include information for the safe purchase of healthy dogs, cats, equines and exotic animals. IPAAG chairman and ISPCA CEO Dr Andrew Kelly said: “As someone committed to animal welfare I would always encourage prospective pet owners to rehome a rescue animal from a shelter or pound but we recognise that people will often turn to their computers when looking to buy or sell almost anything including pets. Website advertisers complying with IPAAG minimum standards is the first step to solving the issues that relate to the online sale of pets, enabling prospective pet owners to buy a healthily bred pet with confidence. The ISPCA and our colleagues in animal welfare regularly hear from people who have purchased a pet online only for it to fall sick or die soon after, which is awful for the animal concerned and heart breaking for the owners”.